G.S.A. strives to bring music to all children by using Dr. Suzuki’s loving and nurturing approach to music education. Our goal is to help create more complete and developed children through the medium of music and cultivate each student’s desire for excellence. Our faculty boasts more advanced Suzuki Teacher Training than any school between Hartford and Manhattan and draws students from Connecticut, New York, and New Jersey. Currently, we are offering private lessons, group classes, parent training seminars, two levels of Orchestra, and Advanced Chamber Music. 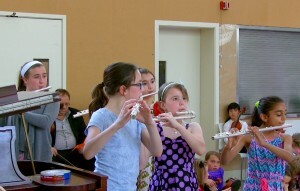 We provide instruction on violin, viola, flute, guitar, cello and bass for ages 3 through 18. All students attend a private lesson and group class each week. We also offer early childhood music education for children ages 0 to 3. Lessons and performances are held at Christ Church, located at 254 E. Putnam Ave, right next to Temple Sholom. We are easily accessed by taking either exit 3 or 4 off I-95.